Hanover, Michigan & surrounding areas...Will search Lakes, rivers, ponds, yards, inside homes for hidden items. There will be a call out fee to cover my gas to get to your location & back. if the item isn't found. We will discuss this before I come out to search. If you require scuba search its still a reward basis but there will be a cost involved to cover my Air for my tanks ...contact me to discuss. Wading, Scuba diving, with VLF and Pulse detector. 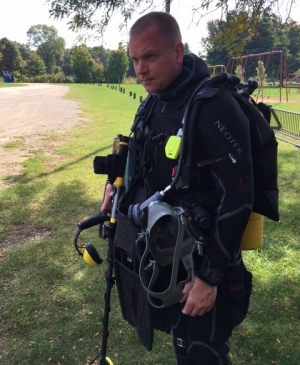 I've been scuba diving since 1995, when I was certified while in the Marine Corps. I've been metal detecting for the past 8 years and scuba detecting for 7 years. I've found hundreds of rings, and jewelry items. I've successfully returned every item to the owner when information pertaining to the owner was present.